Passion, love, drama, heartbreak , redemptions this book held so much and it was so well put together .This story took me totally by surprise because I did not expect to love it as much as I did. There were so many different elements to this story that just captivated me right from the beginning .This isn’t your everyday love story no this is a story of perseverance, and of finding yourself after the storm .Don’t get me wrong there was a part the book I could have thrown my kindle because the hero was a tool but once I continued I got drowned in more .Moby and Pipers love was supposed to last forever in sickness and in health but what happens when one of them breaks that vow and leave the other one slowly sinking. Promises are never made to be broken but when they are how far will you go to heal the heart that was broken. This book took my emotions on a rollercoaster ride and when it ended it left my heart pounding. This was actually my first book by Stephie and this was no disappointment at all. The writing was awesome, the characters were awesome, and the plot was very developed and interesting. Moby is a strong hero but even the strong have weakness and does not make the best decisions even if they think it’s the right one. Piper was soft yet strong and that made her great. Piper did not let her heartaches break her even when she thought she couldn’t go on. This was definitely a great read that I would recommend to someone looking for a new author and something different to read. I can say I would definitely read a book from Ms. Walls because she did an awesome job with this story. On some descriptions of Compass, it's listed as Siren Songs Book 2 and for me, I needed to read book one to feel more comfortable with these characters. 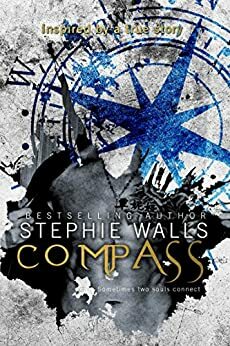 Stephie Walls chose a difficult topic to write about and did it well, however I was a little lost for at least the first half of the book. Knowing more about the supporting characters and "the attack" on one, would have helped me become vested in the continuing story. We are first introduced to Moby and Piper. It seemed like they were friends before getting together and are now married. He sounded like he had quite the past going on, while she was more level headed. To say their friends were surprised by the marriage is an understatement. As Moby and Piper are getting ready to start their new life together, the biggest wrench possible is thrown into this new marriage. It's time to test wills and see exactly what they are each made of and honestly, I found this the better part of the book. The struggle. Stephie Walls gives her readers a big ol' dose of reality. How in a split second everything you know can change. The book is well written from dual points of view and cringe-worthy at times. I had a similar incident early in my relationship with my husband and could relate to some of the struggles Moby faced. However, his are far more serious. I've been anxious to read this book from Ms. Walls. Because let's face it... I'm a stalker fan. That being said I actually feel this book is more of a 3 1/2. But I don't do halves so it's closer to a 4. While the overall plot of this book is heartbreaking and very much personable... I had a hard time connecting to the characters. Moby and Piper had what I'd call a.... complicated relationship. And while I understood Pipers struggle and later Moby's. I keep going back to not being able to relate to the characters. However, the author did an excellent job in communicating the characters. By this I mean, you felt their emotions. And I know... Conundrum considering I said I couldn't relate. But that's just it. It's not my story, it's not a part of my story. I think had the author removed the preface of this in the book it would have worked better for me. However, id rather not let my review be one that dissuaded the reader. Because there's a love story here. A tragic and soul searing one, but there's a love story. There's also characters from Metamorphosis that I absolutely adored. I loved that the author was able to incorporate them into this book without making them "center stage" I do appreciate the personal struggle Moby and Piper had and their ability to work towards overcoming them.